Fancy building up your architectural knowledge? For World Architecture day (1st October), take a look at these Top 5 buildings/structures around the UK which have been built by landmark architects. Many of them also happen to be award winning museums and galleries, so you can head inside after admiring the buildings’ beautifully designed facades for even more artistic inspiration. Officially known as the Metropolitan Cathedral of Christ the King, Liverpool Metropolitan Cathedral as it stands today is the fourth attempt by the Catholic Church to build a place of worship for the people of Liverpool, after the previous designs had been left unfinished and demolished. After winning a competition to once and for all erect Liverpool’s Catholic cathedral, architect Sir Frederick Gibberd was chosen to design the holy house, which aims to reflect the modernisation and radical reformation of the liturgy by the Second Vatican Council at the time. Unlike many traditional churches that have the floorplan of a cross, Liverpool Metropolitan Cathedral is circular in shape, and has the altar at its centre. The exterior is adorned with Portland stone cladding, aluminium roof covering, flying buttresses and a lantern tower with stained glass windows reminiscent of a large crown. It’s all very grand, and looks slightly like a spaceship from the outside, but the interior makes it well worth a visit, to see how the light hitting the stained glass tower beautifully illuminates the cathedral. Choreographer Rudolf Laban’s research explores the living architecture of the body, so it’s fitting that his eponymous school should be architecturally significant! The Laban Building, home to Trinity Laban Conservatoire of Music and Dance, was designed by Swiss Architects Herzog & de Meuron, who are also famous for their redevelopment of the Tate Modern. The exterior of the building is made up of semi-translucent, coloured polycarbonate, creating a mélange of intertwining hues and also allowing some of the internal activity of the dance school to be seen in shadow form from the outside. Meanwhile, inside the colour continues, and unique design choices aim to reflect the fluid motions of dance. One particularly quirky design feature is a “corridor to nowhere”, which is often used as a unique site-specific performance space. Although the building is strikingly modern, the architects took great care to respect the surrounding area with their design, incorporating a brown roof to act as a special habitat for the Black Redstart, one of the UK's rarest birds which resides in and around Deptford Creek, and also taking inspiration from the nearby Baroque Church, St. Paul’s, which is one of the finest in the country. After all, if it ain’t Baroque, don’t fix it. The Laban Building is located at Creekside, London, SE8 3DZ. You can book architectural tours, or take a look at an online tour of the building here. One of the first public buildings to be designed by British architect Norman Foster (also known for designing the Reichstag in Berlin and the Gherkin in London), the Sainsbury Centre for Visual Arts was created between 1974-76 to house Sir Robert and Lady Sainsbury’s donation of their ethnographic and twentieth century art collection to the University of East Anglia. Situated by the River Yare and innovatively designed to house a multitude of functions under one roof, the cuboid, modular structure is built around a steel framework, with aluminium and glass panels adorning the outside. The interior, unlike other museums is left as a vast open space, rather than having many divisions, and a combination of artificial and natural light runs throughout the gallery. As the centre expanded, Foster proposed a new underground extension called the Crescent Wing, which is mainly made of concreate and plaster, contrasting the metal and glass of the original structure. 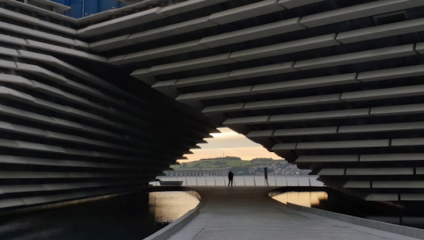 Opened in September this year, V&A Dundee is not only significant for being Scotland’s first design museum, it is also the first building in the UK designed by award-winning Japanese architects Kengo Kuma & Associates. The building is extremely dramatic, with only curved walls supporting 25000 stone panels intended to make the exterior reminiscent of a Scottish cliff face. The aim was to make a museum that was comparable to a welcoming “living room” for the city, reflected by its unique setting on the River Tay waterfront, so it’s fitting that the first installation to grace the gallery is Ocean Liners: Speed and Style which explores life on board luxury ships, and references V&A Dundee’s maritime position. Commissioned by Glasgow book publisher Walter Blackie in the early 20th century, The Hill House is considered to be iconic Scottish architect and designer Charles Rennie Mackintosh’s domestic masterpiece. A man of many talents, Mackintosh designed absolutely everything that you see in the house, from the exterior structure, right down to the textiles and patterns used on the furniture. His elegant simplicity, penchant for geometric lines, and light colour palette contrast the contemporary fashion of the early 1900s, and have become iconic features of the Scottish Arts and Crafts movement. His idiosyncratic design features permeate the house, and even the garden, which has been planted to reflect his preferred hues.